The Youth Festival under the theme ‘For a world of Peace’ and the seminar held on the topic ‘The task of the youth in the struggle against imperialism’ organized by Portuguese Communist Youth, the youth organization of the Portuguese Communist Party and held between 1st and 5th of this month was attended by Messrs. Pubudu Nuwan Samaraweera and Nimal Jayakody representing Socialist Youth Union of the JVP. Representatives of Communist youth organizations in Cuba, Brazil, Colombia, Greece, Palestine, Syria, Russia, Spain, Italy, Belgium, Austria, Germany, Cyprus, Turkey, South Africa, Morocco, Sub Sahara and Mozambique participated in the festival. During the festival a march to protest against the imperialist agendas aimed at violating world peace was organized and representatives of the SYU and World Communist Youth organizations participated. During the festival representatives of SYU and that of Portuguese Communist Youth held several bilateral discussions. They discussed issues confronted by the youths in their countries, how to identify the causes of such issues and solutions for them. They also exchanged experiences they had gained in their countries. Specially, how youths could get a correct knowledge about the capitalist rulers who make various false promises and how youths could be organized to fight for their rights were discussed. Representatives of SYU also apprised the representatives of world youth organization regarding the struggle being carried out by the students’ movement in Sri Lanka against SAITM, the illegal degree shop and the brutal police attack on the peaceful students’ march held on 31st August demanding the government to close down the illegal degree shop. The ‘history of SAITM struggle’ compiled by the SYU was presented and signatures were collected for the petition to add international solidarity for the struggle SYU carries out to protect free education in Sri Lanka. The bodies of people who die from elephant attacks would be bought to the residence of the Minister of Wildlife if no solution is found for the elephant – human conflict states ‘Elephant – Human Protection’ of the All Ceylon Farmers’ Federation. At a press conference held at Dambulla yesterday (14th) they emphasized that the compensation of Rs.100,000 given for a person killed by elephant attacks is not sufficient and it should be raised to Rs.1 million. The National Organizer of the All Ceylon Farmers’ Federation Namal Karunaratna and its President Susantha and several others were present. Colombo Fort Magistrate Lanka Jayaratne today (14th) remanded Chanuka Ratwatte and four others till 28th September over alleged financial fraud of Rs. 4.2 billion under the Public Property Act. Chanuka Ratwatte was arrested by the FCID at his residence today morning and was produced before Court after recording a statement from him. Dharmapriya Bandara Dasanayaka, Romesha Dushanthi Senerath, Sanjeewa Dayaratna and Niloshan Romello Mendis were also arrested with Chanaka Ratwatte and were remanded till 28th September. The case will be heard again on 28th September. A former Navy Commander Jayanath Colombage has been summoned to FCID regarding a state financial fraud. According to police sources he is being questioned in connection with the building of Rajapaksa family burial ground and D.A. 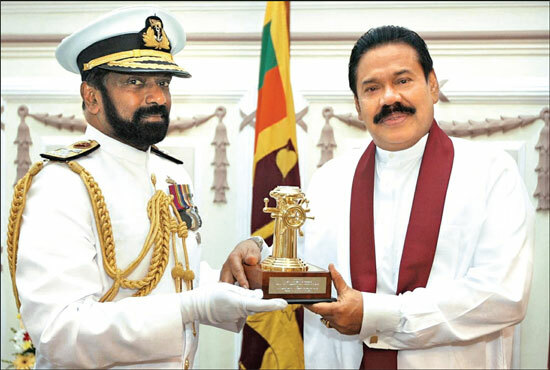 Rajapaksa museum in Weeraketiya area spending Rs.61 million from Land Reclamation and Development Commission. Despite getting Rs.61 million from Land Reclamation and Development Commission for the project all constructions have been carried out by the SL Navy. It has been revealed that on certain days more than 200 SL Navy soldiers had been deployed for the construction work. Investigations have revealed the labour contribution by the Navy for the project could be valued at Rs.29.5 million and Mr. Colombage is question as to why soldiers of the SL Navy were deployed for a private construction. Former Navy Commander Jayanath Colombage is accused of several large scale frauds. When he was the Navy Commander Avant Garde was handed over the sea security service. He is an accused in the case filed by the Commission to Investigate allegations of Bribery or Corruption. Chanuka Ratwatte and four others have been arrested by the FCID today (14th) morning in connection with an alleged financial fraud of Rs. 12 billion. In January this year the passports of six former Entrust Securities’ directors including Chanuka Ratwatte and the former General Manager Sanjeeva Dayaratna were impounded by the Colombo Magistrate’s Court. Entrust Securities, a primary money market dealer run by the family of former Minister Anuruddha Ratwatte, collapsed and its depositors were inconvenienced. There was speculation that over Rs. 6 billion of funds at the Entrust Securities PLC has been unaccounted for. The Leader of National Freedom Front (NFF) and UPFA Parliamentarian Wimal Weerawansa has been summoned to the Financial Crimes Investigation Division (FCID) today (14th) to record a statement regarding his assets. According to sources the statement will be recorded in connection with irregularities occurred at the Ministry of Housing and Construction while he was serving as its Minister. Meanwhile a case against Wimal Weerawansa who is being charged for attempting to go abroad with an outdated diplomatic passport too has been put off till 2nd February, 2017. The Commission to Investigate allegations of Bribery or Corruption too had summoned Wimal Weerawansa to get a statement from him regarding an investigation being carried out on a complaint received stating vehicles belonging to the Presidential Secretariat were misused during while he was a minister in the Mahinda Rajapaksa regime. The trade unions of Department of Customs are to engage in a token strike tomorrow (15th) say reports. The trade unions emphasize that they engage in a token strike to protest against the amendments to the Customs Act as it would increase opportunities to engage in frauds.